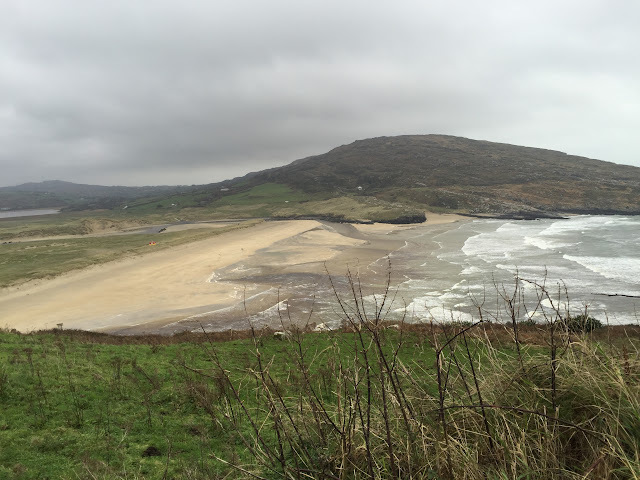 Day 13: Bantry to Mizen Head and back. With no rain this morning, we left the hotel around 10 and drove 27 miles southwest on R591 on a day trip to the Mizen Head Signal Station. 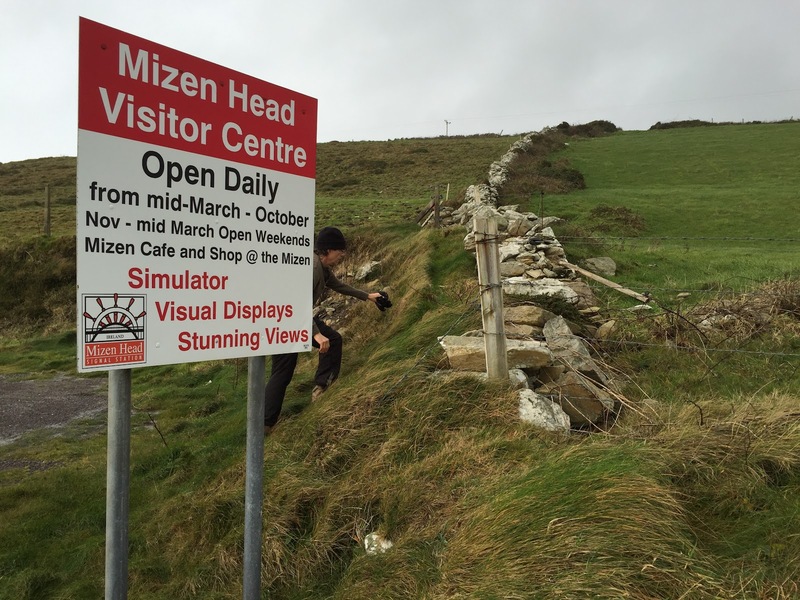 (Mizen rhymes with prison.) 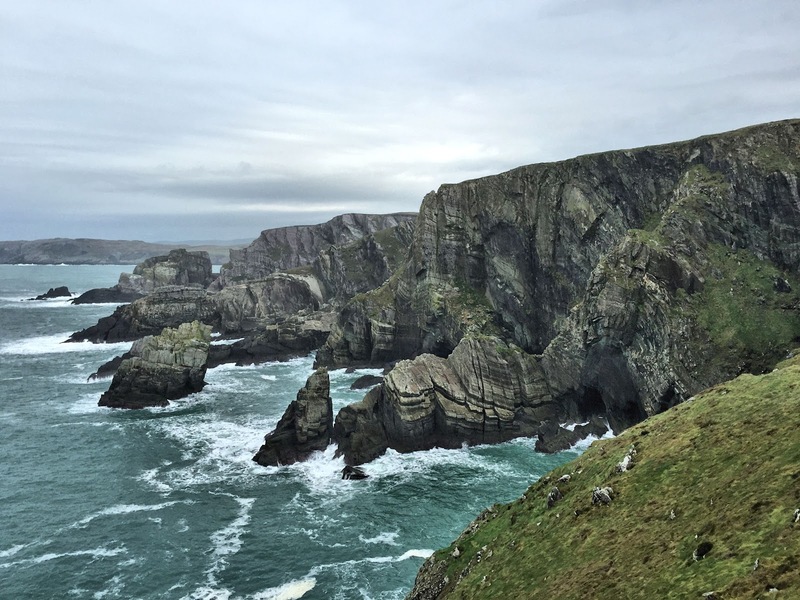 Ireland's most southwesterly point, Mizen Head sits on a spectacular stretch of rocky coastline with 400-ft sheer cliffs above the swirling Atlantic Ocean. From the visitor center, we pushed back at the gusty wind to traverse the cliffside walkway from the visitor center to Mizen Bridge, an arched pedestrian walkway spanning the deep chasm that separates the promontory from the rest of the peninsula. Only a narrow ridge of rock saves the headland from island status. 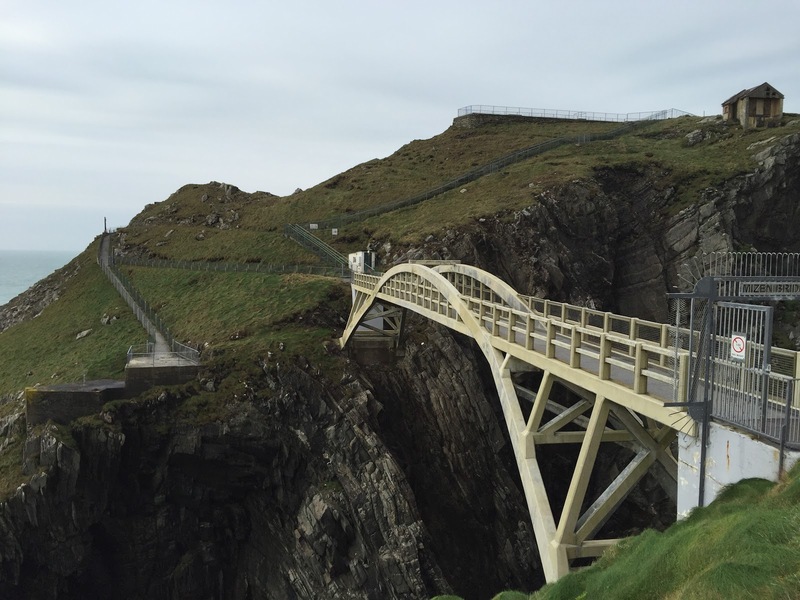 Built in 2010, Mizen Bridge replaced a 1909 span of the same design. 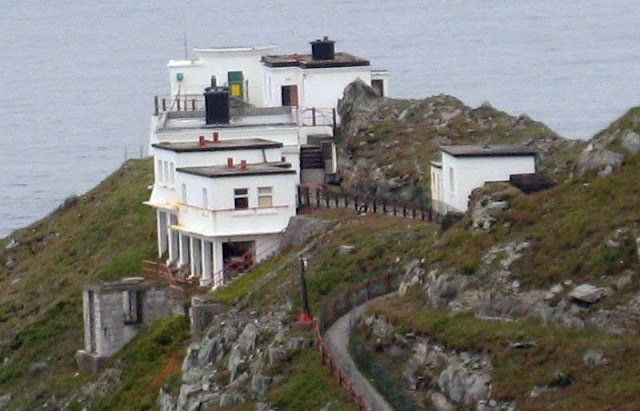 At the tip of the headland, we saw a jumble of buildings which originally served as the Mizen Head Signal Station. Established in 1906 to warn ships away from the rocky shoals in fog, the station was manned by three keepers until automation arrived to replace them in 1993. Today the structures house interesting exhibits about safety at sea, weather and radio stations, including Marconi's pioneering efforts from the location, and living conditions of keepers in the last century. 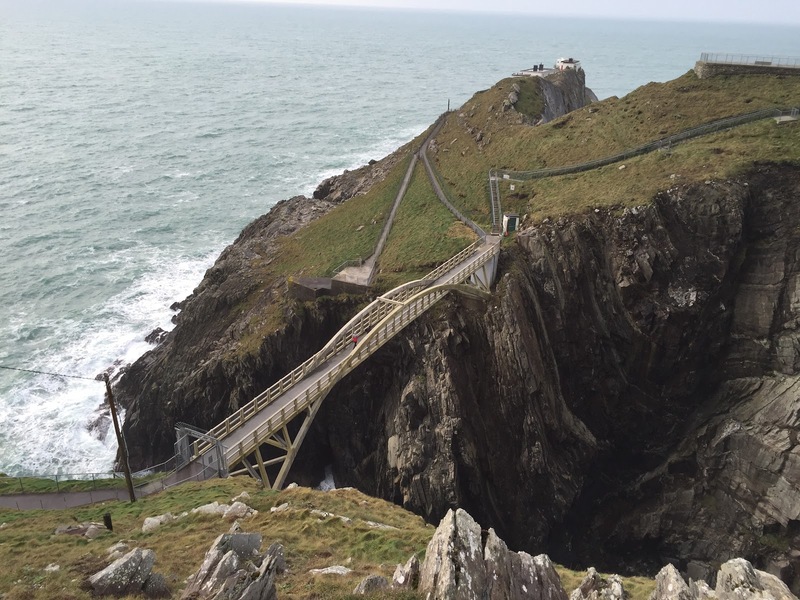 In the summer, whales and dolphins frequent these waters, and seals are often spied below the bridge. But on this blustery winter day, none were to be found. The views, however, were magnificent. 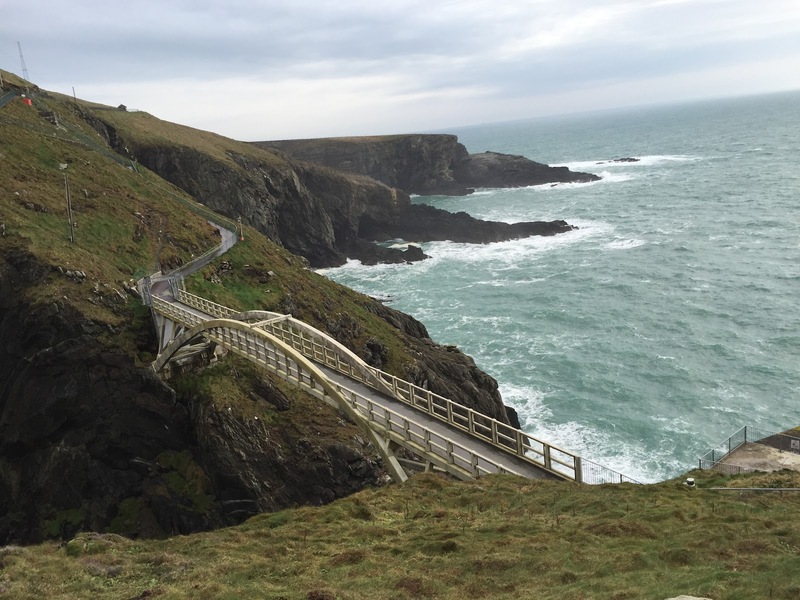 Various paths on the headland lead to scenic overlooks. For our €4.50 senior admission, it was quite a bargain. We were thankful that the predicted rain had not materialized. In fact, we found the place so appealing, we were inspired to plant one of our 'Love This Spot' letterboxes in the hopes of luring other letterboxers to experience this exhilarating place with its spellbinding views. 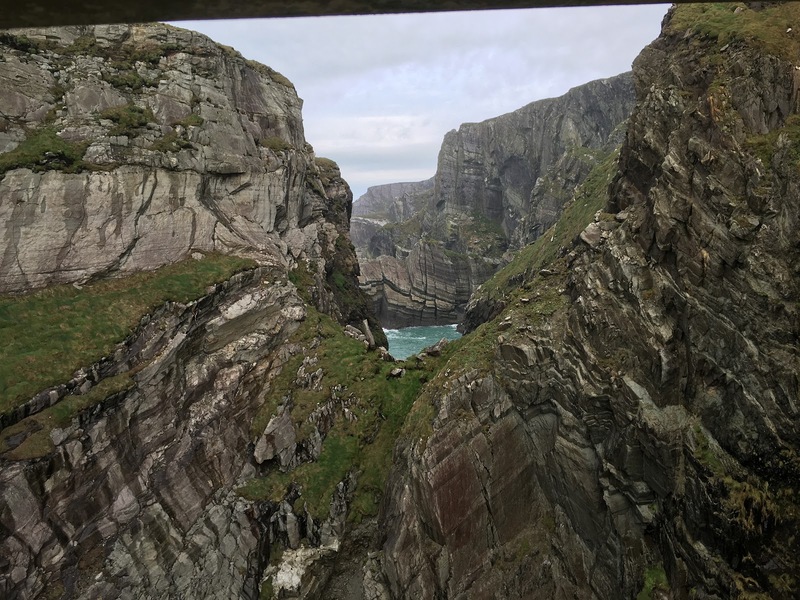 Since Mizen Head is quite popular with tourists, as the size of the parking lot attests, we considered that the area can become quite busy in summer. So we hid our box at the far end of the lot away from the visitor center in hopes that finders will not be observed as they search for it. Since we know that most local drivers prefer to travel a bit faster than we do in this territory unfamiliar to us, we try to move aside to offer opportunities for them to pass us by and continue on their way. The biggest challenge in extending this courtesy is finding a place to pull over. 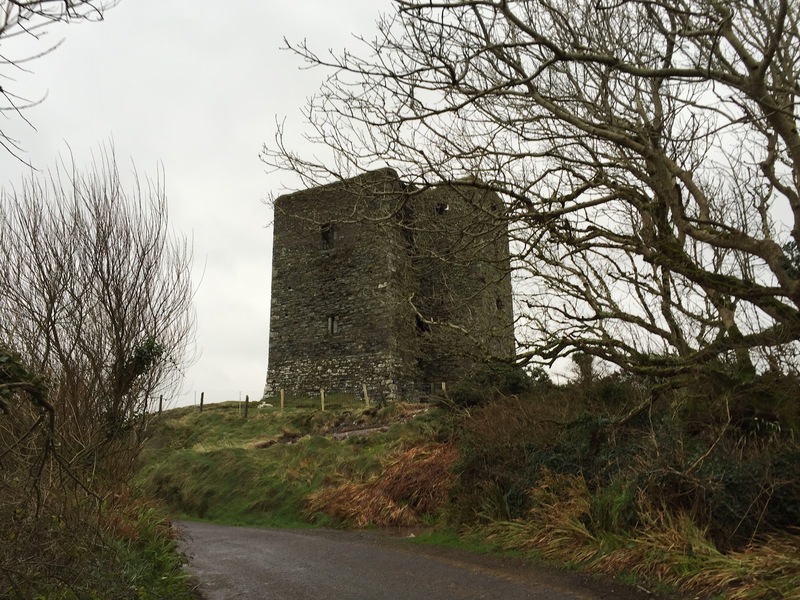 Near the small village of Dunmanus on our return from Mizen Head to Bantry, we turned off onto a small local road to get ourselves out of the way and in the process stumbled upon the remains of what we learned was Dunmanus Castle, the largest and best preserved of 13 castles built on the Mizen Peninsula by the O'Mahoney clan. This one is estimated to have been built around 1430. Depending on which history you believe, the O'Mahoneys were either traders or maybe pirates or even both. What is indisputable is that they built their castles near the sea. As we were nearing Bantry on our way back, we saw a sign warning of road bowling ahead. Road bowling?? Soon we rounded a curve and saw a man wearing a reflective vest standing in the road and signaling us to stop. Behind him were a couple dozen other guys. When we inquired, they told us they were playing an old Irish competition called road bowling. Needing to give the game their full attention—big money was at stake—they didn't have time to tell us more. But there's always YouTube to answer life's many questions. Sure enough, we found a U.S. reporter who explained what it's all about. Color us amazed! 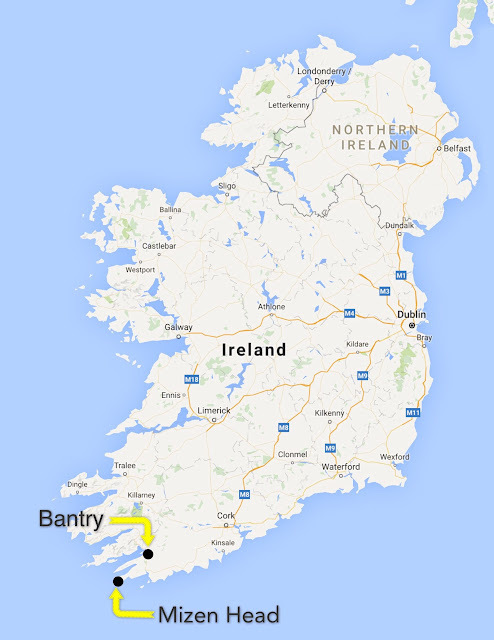 Back in the bustling town of Bantry (pop. 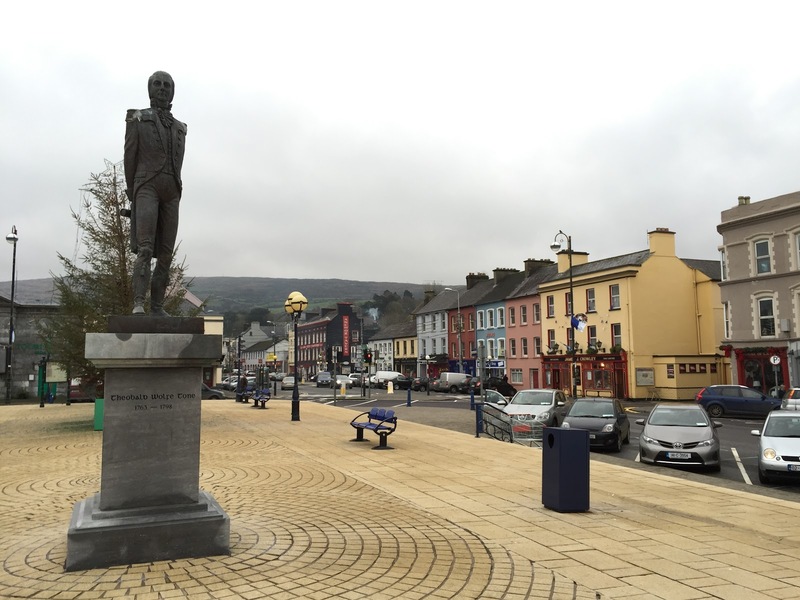 3,309), we were struck by the difference between small towns in Ireland (and other parts of Europe) and those in the United States. As so many have lamented, our dominating big box stores like Wal-Mart have choked the life out of the commercial centers of small town America. Here, those small businesses are still thriving. 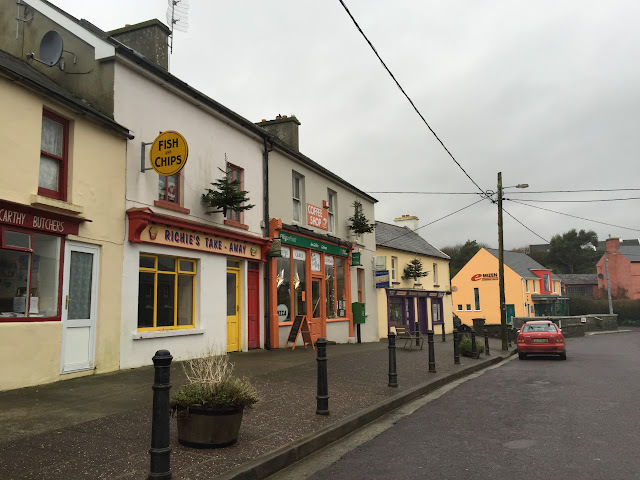 When we arrived in Bantry in the rain yesterday, we needed to resupply some items and make a couple of purchases. Since we didn't want to make the 15-minute walk from our hotel in the rain, we had to troll for that long to obtain a parking space on the street (most storefronts have no parking lot). There was a bustle of excitement and energy as locals conducted their shopping, with many buying Christmas trees from a couple of guys who were selling from the back of their truck across from the local food store. And people seemed extraordinarily patient as they waited in lines in the various shops. One couldn't even imagine an incident of Wal-Mart shopper rage here. Tomorrow we'll continue around the Irish coast, driving through Killarney National Park on our way to Kenmare for our next overnight. In the village of Goleen, small Christmas trees were mounted above doors of storefronts.